Racking up the votes with the right answer were Kara and Minoru. Since it is Thanksgiving weekend I thought we would have a touch of America in this week's Sunday Snap. 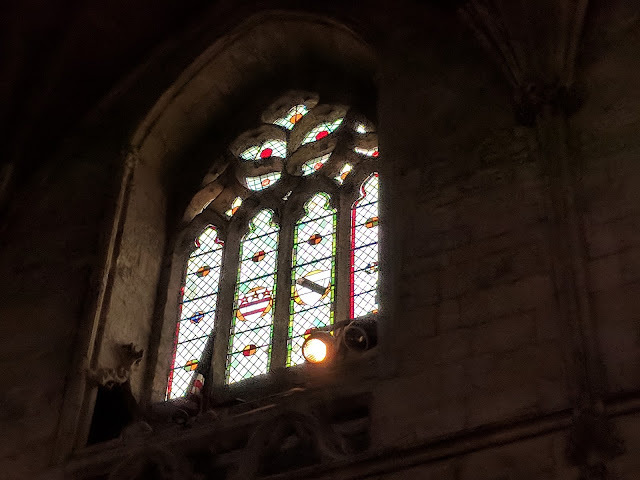 This window is in Selby Abbey in North Yorkshire and it is very high up and tricky to photograph! The window is named after the coat of arms which appears in the window. It belongs to the family of John Wessington who was Prior of Durham between 1416 and 1446. His surname is also listed with a slightly different spelling and pronunciation which reflects the name of the town which used to be in County Durham. This is where the family's ancestral home is located. As Prior of Durham he had links between the monasteries at Durham Cathedral and Selby Abbey. Who was the 1st President of the United States? We were joined last week by Susan and a visit from the Coca Cola truck. Betty has been spotting concretions in New Zealand. There's been some escapism from the adult world for Soma. Finally, Kara has been to Bristol and visited the SS Great Britain and the gorillas at the zoo. If you want to join in with this week's Sunday Snap then add your link to the linky below. Any theme is allowed. It doesn't have to be published today as you have until 23.55 on Friday 30th November 2018 to join in. Grab my badge below for your blog post. Just make sure it is your photo and you hold the copyright for it. It's George Washington, but I didn't realise how little I knew about him. Gorgeous. I love church buildings and windows. His name is George Washington.